I have always had a fondness for soft toys. As a child I had many soft toys and slept with no less than twenty on my bed every night. Mostly I was into tortoises and from the age of four used to carry a very large quilted tortoise around with me everywhere I went. It was at least two and a half feet long and a foot and a half wide, and thus spent much of its time misshapen as I squashed it under my arm. Papa Tort, as he was known, was later joined by the very thoroughly stuffed, bright red Mama Tort, who begat Tootaloo and Uncle Tort and so on… My soft toys were collectively known as The Favourites and, not only were they a great comfort to me as a child, they were also good conversationalists. The Favourites still reside at the family home, known to us as the Workers’ Socialist Democratic Republic Paradise of # Furber Rd. Sadly, however, they have suffered the rather ignominious fate of being stuffed into garbage bags and buried deep in the cupboard. My fondness for soft toys remained undiminished into adulthood. All too often I have rescued soft toys from the street and taken them in. One hot night in Alexandria, in the summer of 1992, my friend Simon and I were wandering the streets on some rather intense, highly hallucinatory acid, when we stumbled upon a large hippopotamus abandoned on top of an old oil heater. The poor Hippo had a badly wounded leg and was in dire need of medical attention, so we took him home and got our housemate Zola to bandage him up. We dressed him up in a waistcoat and tie and Hippo soon became our mascot. He lived a royal life in that house and later moved with me to Erskineville and Glebe. Around the same time as I found Hippo, I also found Bünchen, a small white rabbit discarded from an Easter display at David Jones. I was working in the food-hall at the time and found poor Bünchen lying, dirty and neglected beside one of the bins in the back docks. Little did she know what a glorious future awaited her! When I lived in Rome in 2003, Platty and Bünchen became quite famous amongst the other inhabitants of the British School. They had their photos taken in a number of archaeological sites and other such desirable locations. They returned to Australia with me in 2003 and then returned with me to England in 2006. Again, during the following two years, they travelled with me to many different places. One day in 2008, I was coming down the stairs of Kogarah railway station in Sydney when I spotted a soft toy lying on the stairs. The poor fellow had obviously been dropped by some child on the way, but as there were no children about, I figured he might well have lain there for some time. I was uncertain as to what he was, looking rather like a large-eared, pointy-nosed mouse, but I picked him up all the same and took him into my care. I soon discovered from his label not only that he was a bilby, but he was a McDonalds happy meal toy. Ah, Bilby! 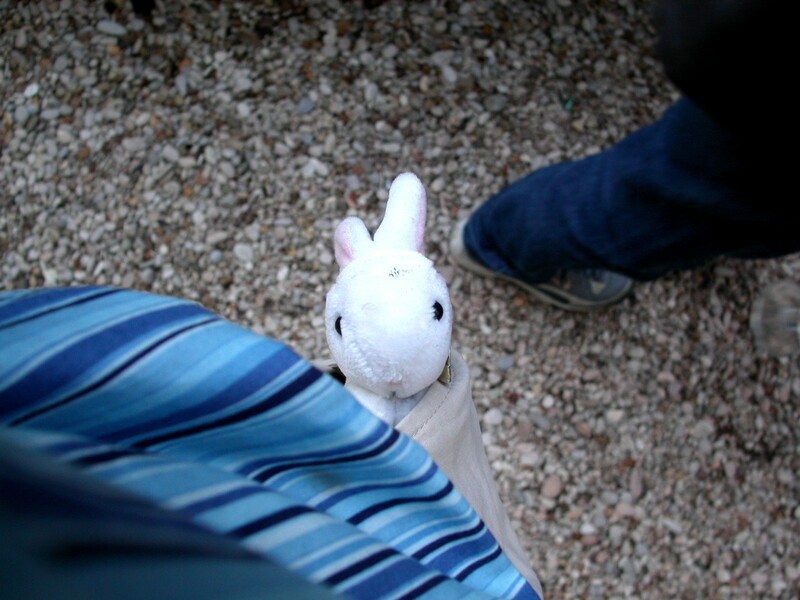 I was instantly very fond of him and placed him inside my manbag. He seemed so at home in there that I took him with me everywhere, everyday. 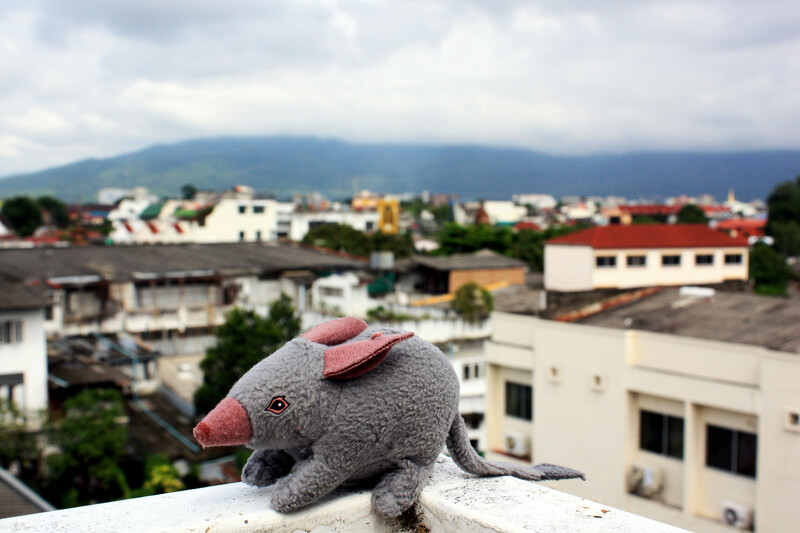 When I travelled to Singapore, Cambodia, Vietnam, Thailand, Macao and Hong Kong in 2009, it was Bilby who accompanied me. Despite the humidity, he thoroughly enjoyed himself and returned safely, a wiser and better travelled Bilby. 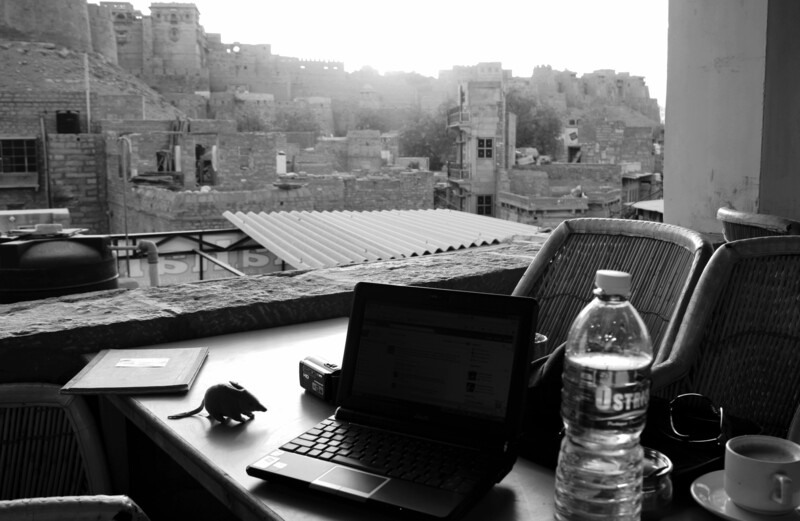 When I left for India for two months in March 2010, it was only natural that Bilby accompany me. He found his way once more into the legendary travel bag which has done no less than 50-odd foreign trips since 2000. It was an incredible and at times harrowing trip, but I made a particular point of keeping Bilby safe the whole time. Indeed, I didn’t lose a single thing and was careful with all my possessions, but Bilby earned special “Bilby checks” to make sure I hadn’t forgotten him or that he hadn’t somehow fallen from my bag. He was as important to me as my passport. When I returned from India, Bilby returned to my manbag. Whilst, like me, he suffered from terrible wanderlust and incurable restlessness, he was good enough to be patient, to a point. Then, sadly, tragedy struck. Early in January of 2011, I was reaching into my manbag to get something and realised I couldn’t feel Bilby in there. I had a closer look, upended the bag and emptied its contents, but there was no Bilby to be seen. I immediately feared the worst and looked everywhere for him. He was nowhere to be found at home, at work, and, well, I could hardly search every bus, train, street and stormwater drain in Sydney for my poor little friend. I soon came to the conclusion that he had most likely fallen out, or, indeed, run away, at some point during New Year’s Eve, when, high as a kite, and cycling around town, I regularly reached into my bag to pull things out. I was devastated, and when it dawned on me that there was no hope left of him turning up somewhere, I turned my thoughts to replacing him. My first port of call was McDonalds, to see if they had a direct merchandising section on their website, where past Happy Meal toys could be purchased. They did not – at least, not beyond the current and previous offer. I turned to Ebay, finding to my surprise a vast array of Happy Meal toys for sale – almost twelve hundred hits – but not a single Bilby. It was at this point that my despair reached a new peak, so I returned to McDonalds and wrote the following e-mail to them. My query is regarding a happy meal toy, more specifically, the Endangered Species series you had on offer about two years ago. I have recently been devastated by the loss of my Bilby. He and I travelled through the whole of South East Asia and India over the last two years and I was especially fond of him as a good luck charm and photographic subject when nothing else would do. I would dearly like to replace him, despite him not being the original, intrepid and well-travelled Bilby who was so loyal to me through so many difficult situations. Is there anyway I can get hold of a replacement Bilby? I cannot find a direct merchandising website for McDonalds and nor can I find a Bilby amongst the many thousands of McDonalds happy toys being sold on E-Bay. If you could help me in any way, I’d be very grateful. I sent the e-mail with more hope than expectation and when, after a couple of weeks, I hadn’t heard back from them, I was ready to give up and was close to getting over the loss of Bilby. Imagine my surprise when one morning, three weeks after sending the e-mail, just as I was leaving for work, I received a phone call from a girl at McDonalds. “We’ve spoken to our distributors and they’ve managed to find you a bilby,” she said. I was overjoyed and thanked her profusely. “Just put some money in the Ronald McDonald House charity box next time you’re in McDonalds,” she said, which I did, next time I passed. Two days later, a brand-new, cherry-ripe Bilby arrived in the post. It was a wonderful moment and I held him close; a powerful symbol of sentiment, loss and recovery. I don’t have much money and there are few possessions I hold dear, but the Favourites have always been special to me. I love them as much as pets. As I write, Bilby 2.0 sits beside me on my desk. After his arrival, I carried him in my bag for three weeks to make him look a little more travelled, and despite the fact that he is not the original and the best, he looks identical and that’s good enough for me. I never thought I’d say this, but, Thankyou McDonalds. Their customer service dedication deserves high praise, though I’m sure they just thought I was some troubled person with an autistic spectrum disorder. 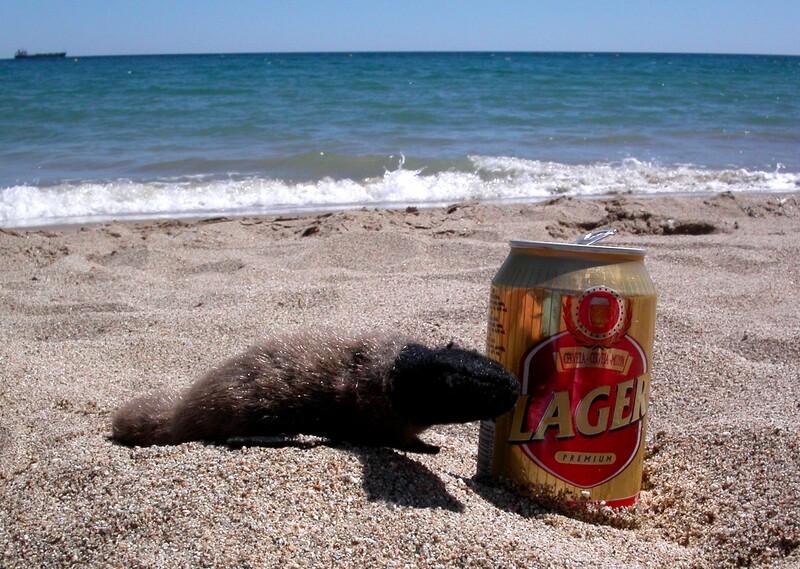 Long live Bilby! And all the many Favourites, for that matter. You replaced Bilby? Don’t you know that’s against the rules; that is like me digging up the love of my life and cloning him. I’d clone all my pets if possible. In fact, it is now possible, though cremation is a pretty effective means of destroying DNA. As for Bilby, he came, in effect, ready-cloned. It sure beats having zero Bilby. When I finally create the museum of my life with everything in glass cases, Bilby shall be displayed in a very prominent place.